Rugged beauty has a double meaning in Marlene Brady’s case. 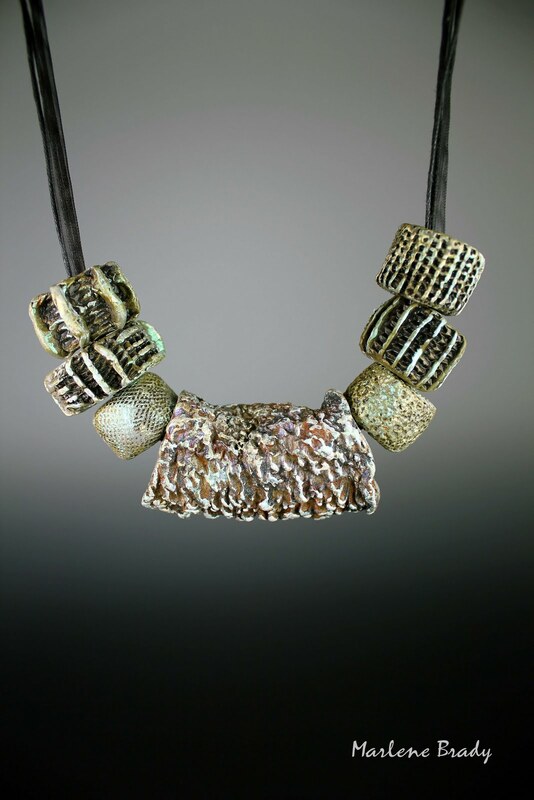 This heavily textured polymer necklace owes its roughness to an indoor/outdoor rug that Marlene purchased and used for a mold before she put it on the floor. She paired the rough bead with other deeply stamped pieces and added layers of paint. Marlene’s going through that stage when everything you see is a polymer tool. You’ve been there, right? Check out her series of stamps from the bottoms of plastic bottles. The clincher is the bag of metal pieces she thrifted thinking that she could surely cover them or use them as polymer tools. But there was another message in the bag. Who but Marlene would have looked at a kitchen rug or a plastic bottle, seen the potential and created such masterful and visually stimulating pieces. Her creative eyes seem to find WAY COOL molds and texturing tools everywhere! I’ll be looking at everyday objects much more carefully in the future. The first clay teacher I had, Joann Hunot, used to tell us to carry some scrap clay around in our pocket to pick up interesting textures. That was in 1992 when teachers brought the clay to class and it was hard to find in stores. She had every color of good old Fimo Classic-all preconditioned. Thank you for the wonderful comments. And, of course, thank you Cynthia for the honor. I am floating on Cloud Nine (no textures up here-so far anyway). I LOVE all the conections to your blog that were posted !! The water bottle is a great idea. I’m personally addicted to metal broken Ice cream & ice scoops i get at work they make great doming forms!! How cool. Spent time wandering through Marlene’s site finding even more cool, thanks! little sculptures, never thinking of using them as molds…. It’s a great necklace. I saw it at the AZPCG meeting. I spent the whole meeting thinking of ways to mug Marlene. I have an outfit that needs that necklace! No really I do. THANKS FOR EXPLAIN THE THE CARDS.